*Tips may not be 100% reliable. 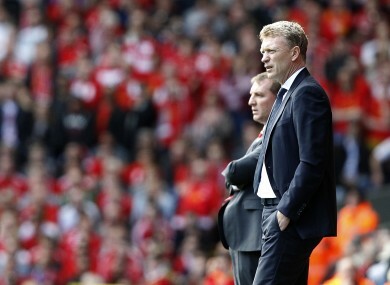 David Moyes will go head-to-head with Brendan Rodgers for the first time as Manchester United manager this weekend. Manuel Pellegrini’s side will be looking to get back to winning ways after falling to a surprise 3-2 defeat away to Cardiff last weekend. Hull won last time out against Norwich and will take heart from the fact they earned a draw with City last time they visited the Etihad. As happy as Cardiff players and management were with last week’s win over City, it will mean nothing if they don’t perform similarly well against Everton. Everton ran out 8-3 winners the last time these two met in the top flight but with Everton struggling for goals under new boss Roberto Martinez, a repeat seems unlikely. It’s only early in the season but, after Newcastle failed to register a shot on target during their scoreless draw with West Ham last weekend, even the most passionate Geordie fans must be worried. Fulham have injury concerns about Maarten Stekelenburg but they could play with no goalkeeper and Newcastle wouldn’t win this one. Mauricio Pochettino’s Southampton are unbeaten in their two games this year and having conceded just two goals in their last six away games in the Premier League, they will be full of confidence. Norwich are not easy to beat at home though, with 32 of last season’s 45 points coming at Carrow Road. Stoke looked a team devoid of ideas and destined for the drop during their opening day defeat to Liverpool but, credit to Mark Hughes, they seemed to turn it around with a win against Crystal Palace last weekend. West Ham have four points from six so far but were disappointed they couldn’t take all three against Newcastle last weekend and will look to make amends Saturday afternoon. Paolo Di Canio is hoping his team can start moving in the right direction with a win today. The hosts haven’t played all that badly since their return to the top flight but still find themselves second from bottom without a single point to their name. Sunderland have been almost as slow out of the blocks this year and Paolo Di Canio will hope their midweek fightback in the league cup can ignite their league campaign. This is perhaps the toughest game of the weekend to call as Manchester United haven’t lost in their last four games with Liverpool while the hosts are aiming to win five league games in a row since 2009. To do that they’ll have to find some way of stopping Robin van Persie who has scored four times in his last three league games against Liverpool. Few would have predicted Swansea would be propping up the Premier League table even at this early stage but Michael Laudrup’s side are still suffering from their opening day trashing by Manchester United. West Brom are equally unlucky to have only one point to show for their efforts, a late Ricky Lambert effort for Norwich accounting for their only defeat. The first North London Derby of the new season and both teams go in with decent form behind them. Arsenal recovered from a shock opening day defeat to easily account for Fulham last weekend while Spurs have two wins from two games thanks to two Roberto Soldado penalties. How many of their new signings slot in for Sunday’s game, remains to be seen. Can’t pick a winner? You can get 36/1 on draws in the Cardiff/Everton, Liverpool/Manchester United and Arsenal/Tottenham games. Disagree? Of course you do. Feel free to leave your own predictions in the comments section below. Email “Premier League preview: how to fill out your football accumulator this weekend*”. Feedback on “Premier League preview: how to fill out your football accumulator this weekend*”.